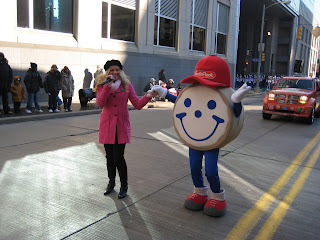 To get in the spirit of the season, Eat’n Park recently participated in Macy’s Celebrate the Seasons Parade in downtown Pittsburgh. Smiley loves a parade and the crowd really seemed to love Smiley. To make it a little more fun, we invited Sarah Marince, rising country singer and singer of our “The Place for Smiles” jingle, to join us in the parade. She sang Christmas songs and our famous jingle. There was a big crowd watching the parade, and we all had a great time. 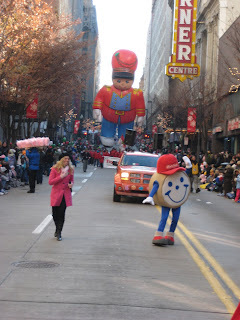 Here are a couple pictures and a short video in case you missed the parade. I hope everyone has a joyous season. Merry Christmas! Happy Hanukkah! I’ll see you at Eat’n Park!